We are super excited to be launching Infinity Dashboard for Mac - a beautifully organized app for keeping track of virtually anything that’s important to you. Learn more and download the free trial by clicking here. 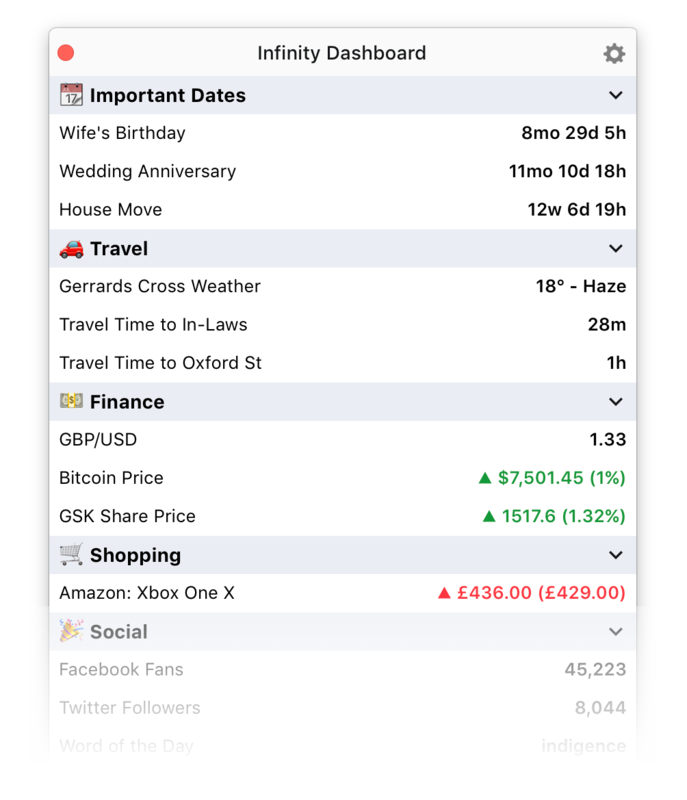 Infinity Dashboard has over 35 modules, such as current weather, exchange rates, stock prices, countdown reminders, Amazon product price tracking, App Store sales, Clicky web stats, travel times, Zendesk open tickets, Fitbit stats, YouTube subscribers, Facebook fans and so much more. See the full list here. This week we were lucky enough to be hunted as the No.1 product of the day on Product Hunt and we are looking forward to developing Infinity Dashboard further in the coming weeks and months. Let us know if you have any good ideas for modules!